A hospital has apologised after a visitor said a woman who had died was then left on a ward for eight hours. 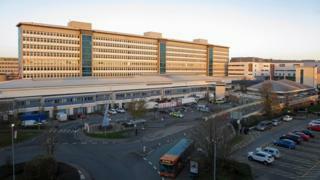 Visitor Helen Regan, 50, said the woman died at Cardiff's University Hospital of Wales at the weekend. Cardiff and Vale health board said building work in the mortuary delayed the removal of the body from the ward. "We would like to apologise for any distress this may have caused," a spokeswoman added. Supermarket worker Mrs Regan said: "Her daughter was there when she died but left the hospital afterwards. "I'm sure she would be quite disturbed if they knew her mum was just left there all that time. "I was appalled and outraged. Surely this lady deserved to have some dignity and respect." The woman's body was moved by hospital staff before visiting ended at 16:00.